Wind and solar infrastructure have been cited in numerous studies as the most economic large-scale resource alternatives to meet the renewable and clean energy demands throughout the country and in the Desert Southwest. According to the National Renewable Energy Lab, southeast Wyoming has one of the densest concentrations of high class wind energy potential in the country. NREL data shows that over 50 percent of the best quality (Class 6 and 7) wind capacity in the continental United States is located in Wyoming. This Class 6 and 7 wind resource has an energy potential of 235,000 GWh/yr. 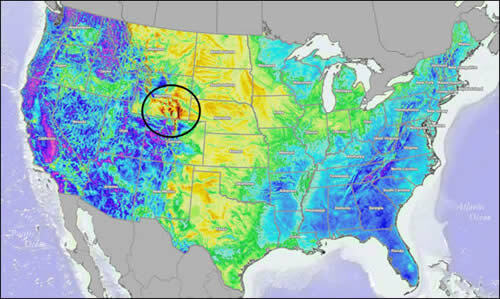 In the specific Chokecherry and Sierra Madre proposed project area, NREL data shows the wind power resource potential as "excellent," "outstanding" and "superb." Only 2% of the land area in the continental U.S. has average annual wind speeds above 8.5 meters/second at 80 meters above ground, according to AWS Truewind. Of that amount, 25% of the best winds are in Wyoming, and 5% are in Carbon County. This wind resource map shows the mean annual wind speed measured at 80 meters. Many electric industry analyses such as those by the Western Electricity Coordinating Council, Western Electric Industry Leaders and National Grid, have looked specifically at regional renewable energy alternatives, including remote resources supplied through new transmission infrastructure, to meet the needs of the Desert Southwest. Wyoming wind resources were identified as one of the most economic alternatives to meet a portion of the overall needs. A note: Wyoming’s higher elevation means lower air density, which in turn causes a performance impact on wind turbines and reduces power production by an average 25% compared to sea level turbines, according to AWS Truewind. Higher-class winds are therefore needed to ensure viable wind projects in Wyoming. See what U.S. wind patterns look like at hint.fm.